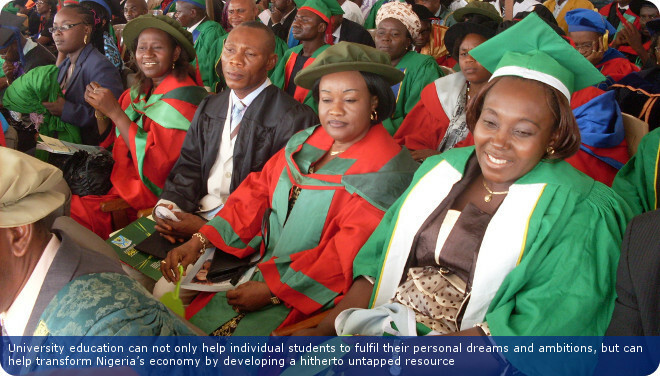 EBSU is driven by the quest for teaching, learning, research, development and excellence. Since 1999 when Ebonyi State University was upgraded to a full-fledged multi-disciplinary University, by His Excellency Governor Sam O. Egwu, the school became one of the few Universities fully committed to development of academic programmes in the areas of Law, Science and Technology, Education, Arts and Humanities etc. In its multi-annex dimension, EBSU has always aimed at being one of the outstanding state Universities unequalled in Nigeria. EBSU is constantly repositioning itself in pursuit of pride of place and a greater dynamic vote in pure Research and Development (R&D), both at the graduate and post-graduate levels. These R&D efforts are already manifesting in the several national and international awards to staff and students in various fields of study. EBSU offers academic programmes with a wide range of courses tailored to suit individual desires and prepare the students strongly enough to achieve their dreams and ambition. EBSU takes special interest in training and retraining of its academic staff on scholarship. Relentlessly, EBSU has been dedicated and committed to superlative training of staff and students; core research and information technology; scholarly and economic empowerment. Undoubtedly, these pioneer outstanding efforts in most respects, made it possible for the National Universities Commission (NUC) to rank EBSU third in the country among state-owned Universities in 2005. The Work and Study Program of EBSU creates opportunity for talented, intelligent and qualified working adults in various life endeavours to acquire University education without having to give up their jobs as civil servants, self-employed individuals in business, employees of companies and corporations. It is one way in which EBSU makes its services available to as many people as possible and thus advance the literacy campaign of the state government. The programme believes that with better education, efficiency, effectiveness and high productivity will be achieved in the work place. Through the Faculty of Health Sciences and Technology, EBSU partners with the Presbyterian Church School of Nursing Uburu, Ebonyi State which is to be affiliated to the University to deliver the standard content and run programmes in BSc Nursing and Medical Laboratory Technology. The programme’s curricula for the courses are exactly the same with that used at the Departments of Nursing and Medical Laboratory Science EBSU as approved by the National University Commission. Together with the Faculties of Basic Medical Sciences, EBSU has (and continues to) produced the medical doctors, nurses and medical laboratory scientists needed in Ebonyi State and beyond to deliver quality health care services. The University supports financially the hosting of workshops, seminars and conferences by different departments, faculties and professional societies. Staff and students are also supported to participate in conferences locally and internationally. EBSU is working with the Federal Government of Nigeria to realise the Education target of the Country. It is worth mentioning the benefits EBSU has derived from the Federal Government Education Trust Fund (ETF) grants. These grants are specifically used for research, capacity and infrastructure development. Many buildings have been constructed, or renovated; many researches have been sponsored and scholarships awarded to staff for further studies through the grant. EBSU had collaboration with Universities in United Kingdom under the HiPACT programme. It involved UK lecturers coming to lecture at EBSU and also facilitating students to study in Britain. The programme commenced September 2000 and ran through 2004. This programme provided a rare opportunity that enabled staff and students to have global exposure. Many EBSU academic staff benefited from the programme. Two EBSU lecturers have been awarded the Alexander von Humboldt Foundation Post-Doctoral Research Fellowship in Germany in 2005 and 2009. The research areas are Fisheries and Aquaculture and Molecular Microbiology. Through that linkage the Foundation has sponsored researches and laboratory equipment in the institution. The Foundation sponsors individuals who have demonstrated outstanding achievements in research and who contribute significantly to international co-operation and understanding. Other fellowships, sponsorships and grants have been received by staff from Third World Academy of Science in the area of application of biotechnology in Fisheries Production, 2008; Japan Society for the Promotion of Science, 2008 and International Foundation of Science (IFS) in the area of Plant Molecular Biology, 2008. International Centre for Genetic Engineering and Biotechnology (ICGEB), 2009 and Norman E. Borlaug International Agriculture and Technology Program for Women in Science, 2009 awarded grants and sponsorships to staff in plant breeding and crop improvement research. Nestle Foundation in 2009 delivered a collection of more than 150 books and practical manuals on nutrition, medicine and public health to develop a mini library for the Home Economics Department of EBSU. This was part of the Foundation’s enLink Trunk Library Project for capacity building. The Alliance for Green Revolution in Africa (AGRA)/Bill and Melinda Gates sponsored a rice-breeding programme for the development of a high yielding, stable, drought tolerant and high quality rice seed variety for resource-poor farmers in Nigeria between 2007 and 2012. Ebonyi State University has entered into an understanding with Hokkaido University, Japan for research collaboration and student/staff exchange programmes. In 2008, Ebonyi State University and the Ministry of Education, Thailand entered into a Memorandum of Understanding (MOU) on direct exchange and admission programmes, with over 400 institutions of higher learning cutting across all major fields of academic and human endeavour. The programme gives opportunity for a six-month industrial training of undergraduates in any given field offered at one of the Thailand institutions covered by the MOU. Many students have benefitted from this programme. In 2010, EBSU won the ATPS Climate Sense Program grant to study the constraints, impact, mitigation and adaptation measures of smallholder rice farmers to climate change in southeastern Nigeria. EBSU is also working on a CIDA-funded project on ‘Strengthening higher Education Stakeholder relations in Africa’. In this programme, an African university is paired with a Canadian university and understudies the processes and patterns of community engagement for the Canadian University for the purposes of upscaling their own practices. From 2009 to 2011, EBSU has been championing a World Health Organization (WHO) funded research on ‘enhancing the capacity of health policymakers for evidence-informed policymaking’ aimed at strengthening the health systems in developing countries. This project is supported by Alliance for Health Policy and Systems Research of WHO in five countries including Argentina, Bangladesh, Cameroon, Zambia and Nigeria. Currently EBSU has two other ongoing researches funded by WHO. In 2012, EBSU through the Directorate of Research Innovation and Commercialization engaged with the Federation of Universities of Applied Sciences (FUAS), Finland of which Laurea University of Applied Sciences Finland is a partner for a joint research project following their proposal. The negotiation was successful and on 5 November 2012 a memorandum of understanding was signed for the collaboration of EBSU with universities in ’CONNECT – Co-creation of network modes for market entry in developing countries – Finnish renewable energy SMEs’. The project is looking for universities that are interested in developing new forms of supporting SMEs in their respective regions in the field of international business and hope to co-create new sustainable network modes together with these universities and other stakeholders. This project called ‘GROOVE CONNECT’ has the intention to support knowledge transfer, knowledge development and capacity building in the areas of renewable energy technology, environmental management and education in developing countries. In 2014, EBSU has been nominated alongside another 12 universities in Africa by the Association of Commonwealth Universities (ACU) to take part in Advancing Early Career Research in Africa. This new project is intended to work with African universities to develop and refine professional development for academic staff early in their careers. The project is still running effectively. In the same vein, EBSU has also been selected as a Home Institution for the Climate Impact Research Capacity and Leadership Enhancement in sub-Saharan Africa programme (CIRCLE). The CIRCLE programme is an initiative of the Department for International Development (DFID) of the United Kingdom to develop the skills and research output of early career African researchers in the field of climate change and its local impacts on development. The programme will run from 2014 to 2018 and will be managed and implemented by the Association of Commonwealth Universities (ACU) and the African Academy of Sciences (AAS). These academic feats can only be possible with the right co-operation of everyone as a team, with strong dedication, commitment, hard work and faith. With such efforts in concert the sky will be the beginning in making EBSU a global force to reckon with in the quest for creativity, development and excellence. I humbly welcome you to savour the greater opportunities at our University. Eng. Prof. Idike, Francis Igboji was born on 10 May 1945. He holds a BSc Agricultural Engineering (1974) from Punjab Agricultural University Ludhiana-Punjab India; MSc and PhD, in Agricultural Engineering (1977, 1981) from the University of Minnesota, Minneapolis, St Paul Minnesota, USA. He is a specialist in Soil and Water Engineering, and teaches Agricultural Engineering. He is a Professor and Registered Engineer. He is a seasoned academic who has published many articles in national and international journals. He has served as Head of Department severally at the University of Nigeria, Nsukka; Associate Dean, Faculty of Engineering 1984-1995 and April 2000-2002; Dean, Faculty of Engineering, August 2004 to February 2005. He became the Deputy Vice-Chancellor (Administration) and member of the Governing Council of the University of Nigeria, Nsukka, February 2005 to December 2008. He also became a Member of the Governing Council of Ebonyi State University, Abakaliki, October 1998-June 1999 and October 2004 to date. 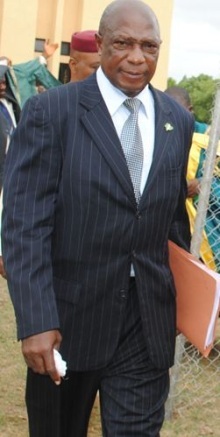 From December 2008, he was appointed the Vice-Chancellor of EBSU. On public administration he has held several government positions including Honourable Commissioner for Agriculture and Member of the Executive Council, Government of Anambra State of Nigeria, February 1984 to January 1986. He served as the National President, Nigerian Society of Agricultural Engineers (NSAE) 1985-99. He is married to Barrister (Mrs) A. Idike and has four children. What is today known as Ebonyi State University started with a resolution of the then Military Administration of Anambra State, and was later upheld during the Civilian administration of Chief Jim Nwobodo as governor. On July 30, 1980, Anambra State government established the Anambra State-University of Science and Technology, ASUTECH by law no 7 of 1980; thereby establishing the first University of Science and Technology in Nigeria. The ASUTECH Edict no. 20 of 1985, put in place a four-campus structure with the College of Agricultural Sciences (CAS) located in Abakaliki. Lectures started in the Abakaliki campus faculty of Agriculture in November, 1987 with 55 students and 15 academic staff including students of the department of Horticulture and Plant Protection transferred from Awka campus of ASUTECH. The faculty graduated the first batch of students in 1991/92 academic session. In 1987, a pre-science school was established in the Abakaliki campus of ASUTECH. On August 27, 1991, Enugu State was created out of the old Anambra State so that ASUTECH campuses in Enugu and Abakaliki were inherited by Enugu State University of Science and Technology, ESUT via Enugu State government Edict no. 33 of 1991 and amended in 1995 with the Abakaliki campus remaining as the new ESUT faculty of Agricultural Sciences. A year later, 1992, a College of Medicine was added. At the creation of Ebonyi State in 1996, the Abakaliki campus of the then ESUT, was upgraded to Ebonyi State University College by Edict no. 5 of Ebonyi State, 1998 and remained affiliated to ESUT with Prof. Ogah, former ESUT Deputy Vice-Chancellor, as the first Rector. In 1997, the faculty of Applied and Natural Sciences with 8 departments was added to the fledging University and later in 1998 when the ESUT pre¬science programme was relocated to Nsukka, the EBSUC Pre-Degree School commenced lectures in both science and arts in replacement of the former. In 1999 His Excellency, Dr. Sam Ominyi Egwu, First Executive Governor of Ebonyi State announced the upgrading of the University college to a full-fledged multi-disciplinary University and the establishing law (Ebonyi State University law No 7, 1999) received executive assent of His Excellency in January 14, 2000 with Prof. Fidelis Ogah as the first Vice-Chancellor. Resulting from the autonomous status, 4 additional faculties were created. Viz: the faculties of Arts with six departments; Education comprising six departments and Management and Social Sciences having nine departments. In the year 2000, the faculty of Law and the School of Post-graduate Studies were established in addition to the Work and Study Programme, WASP a week-end programme mapped out for workers who desire University education while retaining their jobs. In 2002, a new faculty of Health Sciences and Technology was established. It took off in 2002/2003 academic year with departments of Nursing Sciences and that of Medical Laboratory Sciences. In December, 2008, the 3rd Governing Council was inaugurated by His Excellency Chief Martin N. Elechi, the Executive Governor of Ebonyi State and Visitor to EBSU. Dr Ajah Nwachukwu is serving as EBSU Pro- Chancellor and Chairman of Council. Engr. Prof. Francis Igboji Idike took over from Prof Fidelis Ogah as the Vice Chancellor of the University on 24/11/2008. To rank among the best citadels of learning in the world with excellence in learning, research and community service. To provide a conducive atmosphere for teaching, learning, research and rapid development in order to transform the hitherto, untapped, abundant unkilled, human resources in Nigeria into skilled manpower. The goals and objectives of Ebonyi State university are consistent with the objectives of the National Policy on Education, particularly Higher Education in Nigeria as enunciated by Decree No. 16 of 1985. The law establishing Ebonyi State University (Law No 7 of 1999) states the objectives of Ebonyi State University as follows. To provide such facilities (as its resources permit) for the pursuit of leaning and the acquiring higher education. To make those facilities available on proper terms to such persons as are equipped to benefit from the use of the facilities. To foster the spirit of creativity, inventiveness, resourcefulness and patriotism. To undertake other activities that can conveniently be undertaken by the University.